The Institute for Biogenesis Research at the John A. Burns School of Medicine has been awarded $10.8 million from the National Institutes of Health to continue its groundbreaking work in reproductive and developmental biomedical research. The institute laid the scientific foundation for human in vitro fertilization under founder Ryuzo Yanagimachi, whose assisted reproductive methods are still being used around the world to help infertile couples have children. The institute also cloned the world’s first mouse and has developed new, more efficient methods to produce transgenic mice, rabbits, lambs and pigs. 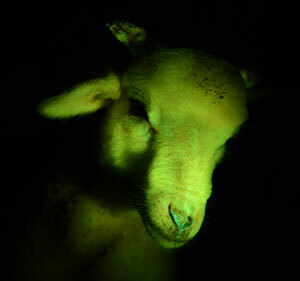 The animals glow green under black light, demonstrating a more-efficient genetic manipulation technique developed in Hawaiʻi. The technique may lead to new and competitively efficient ways to produce medicines. Institute for Biogenesis Research scientists competed with researchers all over the U.S. to win this phase-two Centers of Biomedical Research Excellence award. The new grant brings the institute’s total research dollar awards to nearly $40 million dollars in the past 15 years. Ward said Hawaiʻi residents benefit from the research award, because nearly all of the funds are spent here in the islands. “The $10.8 million grant that we just brought in, 80 percent of that, or $8.7 million of that goes directly into the Hawaiʻi economy,” said Ward. Research grants awarded to the medical school also help support operations of the University of Hawaiʻi as a whole—half of all research money the medical school brings in goes to UH Mānoa and the UH System to spend in Hawaiʻi.